This collection of Japanese supernatural stories is a classic work in the field of Japanese horror. Known primarily as an early interpreter of Japanese culture and customs, the famous writer Lafcadio Hearn also wrote ghost stories-"delicate, transparent, ghostly sketches"-about his adopted land. 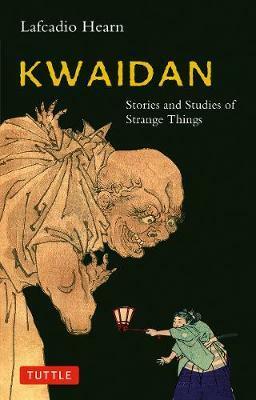 Many of the stories found in Kwaidan, "stories and studies of strange things," are based on Japanese tales told long ago to him by his wife; others possibly have a Chinese origin. All have been re-colored and reshaped by Hearn's inimitable hand. Some critics attribute Hearn's fascination with eerie tales to his partial blindness. Whatever its roots, he was drawn to the hidden realms of the spirit world with its strange facts and marvels. In this collection of unforgettably haunting stories, Hearn brings together "the meeting of three ways"-the austere dreams of India, the subtle beauty of Japan and the relentless science of the Western world. Lafcadio Hearn (1850-1904) was born on the Greek island of Lefkas, the son of an Anglo-Irish surgeon in the British army and a Greek mother. After his parent's divorce when he was six, he was brought up in Dublin by a great aunt. At the age of nineteen, he went to America, eventually ending up in New Orleans as a newspaper reporter. His flight from Western materialism brought him to Japan in 1890, where he worked for an English newspaper, the Kobe Chronicle, and taught in various schools. In 1896, he began teaching English literature at Tokyo Imperial University, a position he held until 1903, and at Waseda University. Hearn married a samurai's daughter, Koizumi Setsu, became a Japanese citizen and a Buddhist and changed his name to Koizumi Yakumo. At the young age of 54, he died of a heart attack. Hearn's search for beauty and tranquility, for pleasing customs and lasting values, made him a confirmed Japanophile. His keen intellect, poetic imagination, and wonderful clear style permitted him to penetrate to the very essence of things Japanese. He became the great interpreter of things Japanese to the West. Hearn's most famous work is a collection of lectures entitled Japan: An Attempt at Interpretation (published posthumously in 1905). His other books on Japan include Glimpses of Unfamiliar Japan (1894), Out of the East (1895), Kokoro (1896), Gleanings in Buddha Fields (1897), Exotics and Retrospectives (1898), In Ghostly Japan (1899), Shadowings (1900), and A Japanese Miscellany (1901).